When your unborn or newborn child is diagnosed with Spina Bifida Myelomeningocele, there are a number of things that tend to go along with it that you can somewhat see coming over the course of childhood and on into adulthood: hydrocephalus, Chiari II Malformation, clubbed feet, bladder and bowel issues, tethered cord. These things are told to you (usually/hopefully) by the various doctors you meet along the way and/or the books you pick up in the hopes of better understanding and preparing yourself for the road ahead. What you quickly learn from either your own child’s experiences or reading through the trials and tribulations of other families on this journey is that Spina Bifida doesn’t come in a nice little Bento lunchbox with its neat compartments all squared off, keeping each item of food just how I like it – separate and not touching. Spina Bifida is more of a tossed salad – made unique for each person born with it. While there will always be weakness and lack of sensation of varying degrees in areas of the lower extremities (or higher), and while there will always be bladder/bowel dysfunction of some sort, and while everyone will have a Chiari Malformation of varying severity, the rest is different for each person. Most but not all have hydrocephalus, a good number have clubbed feet, and while all will have tethered cord – not all will require surgery. 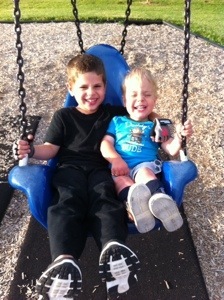 Then come the casualties of Spina Bifida. Breathing issues due to low tone result in children with trachs. Hyrdrocephalus and shunts can mess with vision resulting in patches, glasses or other eye issues. Hip issues are prevalent due to the low tone and alignment issues. Head shape issues due to hydrocephalus or premature birth or other tone issues. Scoliosis becomes problematic later in life. Kidney infections and failure are real possibilities. Other cysts are found along the spine. It just seems to be that once you mess with the spine, nothing is safe. This is one of the hard parts of SB – just not knowing what may come or when or how to prepare for it. Most people with SB will have countless surgeries throughout their lives. And Colten? He has now completed his fifth surgery at the age of 21 months. We are thankful that we have no more surgeries in our immediate future, yet are not naive enough to think he won’t need any more. Colten’s surgery was on Monday and was a continuation of his last surgery in November plus another issue that arose since then. In November, Colten had a 1st stage orchiopexy done. He had an undescended testicle that they went in laparoscopically and started the re-routing process. After that surgery was over, Dr. Wan was clear that while usually he can do both the 1st and 2nd stages laparoscopically, due to all the shunt tubing coiled in Colten’s abdominal area, it was unlikely he could do stage 2 without opening him up. Then Colten had an inguinal hernia appear over the winter and while it was not causing him immediate issues, it did need to be repaired so thankfully we could do it all at once in this surgery. The surgery was a success – everything was put back in place and repaired and re-routed and all that needed to be done. Colten has two decent incisions in his lower abdomen and another a little further down south. Monday was a rough day for him and he took a while to truly wake up from anesthesia. His surgery was about two hours – over around 1:15 PM. He was not discharged from the hospital until after 5pm. He then slept most of the way home from Ann Arbor and then cuddled up on me the rest of the evening. He slept most of the night, waking intermittently, then was up Tuesday morning. While a slow start to the day, he was ready to eat again and seemed to be much more himself. The biggest thing, and best, was that he really did not move at all. Kids are pretty self-preserving and apparently it was uncomfortable for him to move so he didn’t. If I sat him on the couch, he stayed there. If I sat him on the floor, he stayed there. He asked to be picked up when he wanted to move elsewhere but was content just sitting still. As of today, Wednesday, he still has a LOT of swelling and redness and was extremely hesitant to move. He did finally crawl a tiny bit – very gingerly. Good thing because he is supposed to stay low key for about 4 weeks, when we see Dr. Wan for a re-check. 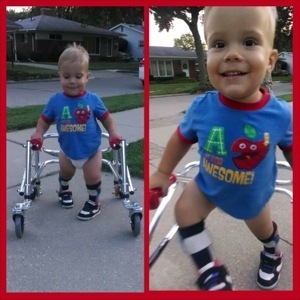 Here’s a couple photos of Colten in his new walker – thanks to my sister, Kara, for snagging a couple shots of him actively walking! 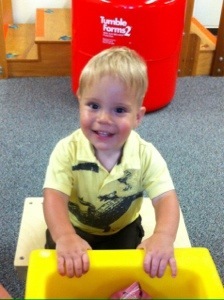 On that note, Colten will be ready to roll again in time for the Spina Bifida Association of Michigan’s Walk ‘n Roll! We are holding this event that focuses both on awareness and fundraising, in Waterford, Michigan, on August 16, 2014. The COLTRAIN team is taking passengers (and donors) and we would love for you to join us! Before closing out, a special thank you to my cousin Jerry for making Colten some amazing foot-holds for his tricycle pedals! We used these special pedals at the ISD and wanted to get a set for our own many trikes at home to see what might work for Colten. They can be easily moved from one trike to another and velcro the foot into the hold securely. We borrowed a pair from them to photograph and measure. Sending that information along to my cousin, a woodworking expert, he masterfully crafted a pair for Colten and now we can work on biking (well, after he heals up)! This is great exercise for his legs and hips. 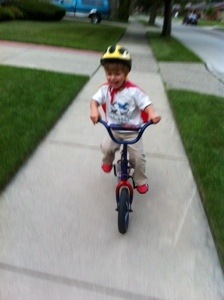 Next summer he should be eligible for a special trike that will allow him to pedal with his hands and his feet together. 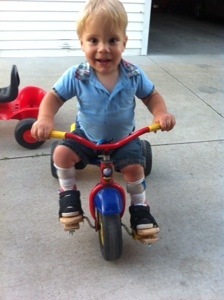 For now, we combined the pedals and another homemade PVC handle to create our own trike for him. So thank you VERY MUCH for the wonderful pedals cousin Jerry! Praying he’s feeling better soon! 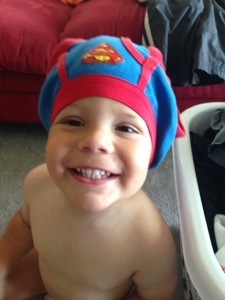 He sure is a cutie!